2015 Census shows record biking in Minneapolis! Biking is up (again) in Minneapolis, according to the latest U.S. Census data. 2015 marked a new bicycle commuter record in Minneapolis with 5% of Minneapolitan workers regularly biking to work. Bike commuting is up 155% in Minneapolis since 2005 and was up 12% from the then-record level in 2014. In 2015, 43% of Minneapolis bicycle commuters were women, well above the national average of 29%. The Census estimates a record 5,024 female Minneapolis bicycle commuters--a 177% increase from 2006. It's worth noting that the Census only classifies people as "male" or "female." Let's hope they move on from the gender binary ASAP! Minneapolis stayed second in bicycling commuting among large U.S. cities, behind Portland. The growth in Minneapolis biking has fueled growth in bike lanes and protected bike lanes, which undoubtedly have fueled additional growth in biking. Part of why we are excited to see continued growth in biking is that more biking means more awareness of biking and safer biking. This chart from Minneapolis Public Works shows how the relative rate of bicycle-motorists crashes has decreased as bicycling has increased. Safety in numbers! We have a strategic goal to double biking in Minneapolis (from 2014 levels) by 2020. This report means we are close to on track to meet that goal! Lots more work to do! We want to double biking because of the many people that would benefit and the societal benefits for safety, health, environment, and wear and tear on streets. More on the benefits of doubling biking in Minneapolis in this report from Alta Planning and Design. St. Paul set it's record for bicycle commuters as well--at 2.1%. 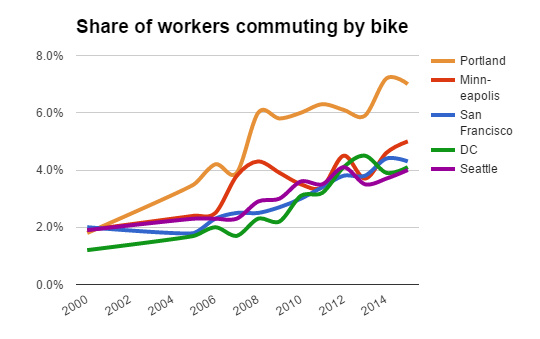 They have tripled the share of commuters biking since 2007 (when it was 0.7%). Congrats to everyone working in St. Paul! The number of people walking to work stayed about the same in Minneapolis. 7.5% of commuters walked to work! We're excited to start working for pedestrians too! These Census figures only reflects people who say that bicycling is their primary way of getting to and from work. It reflects an average over the course of the year (summer would be higher, winter lower). A 2015 University of Minnesota report suggests that the share of total trips (commuter and non-commuter) by bicycle is higher than the Census commuter estimate. Current News »2015 Census shows record biking in Minneapolis!